I installed tein S tech springs on my 2013 accord sport and now my abs light, traction control light and electric steering lights are all on. The dealer is telling me there's nothing I can do about. Any help would be awesome! Did they check for codes? If so what were they. No, the tech just told me I have to put it back to stock. I was thinking of disconnecting the battery to see if it will reset the computer. I also emailed tein to see what they say. I'm sure they had to disconnect the ABS wheel sensors while changing the springs. Forget to plug something back in? That would be my guess... They could have also damaged a wire. These apparently change ride height. This may affect steering angle sensors, response and cause problems w/ ABS, TCS systems. Did you change any tires? Change in tire diameter could also cause problems. Best bet may be to return to stock condition. Advance Auto may or may not have a reader/scanner capable of reading Honda ABS/TCS trouble codes. Although the steering angle sensor can cause VSA (Vehicle Stability Assist)* issues and trouble codes, just changing the ride height would not generally affect the steering angle sensor. The steering angle sensor is part of the steering column. It is used to confirm the steering wheel position. 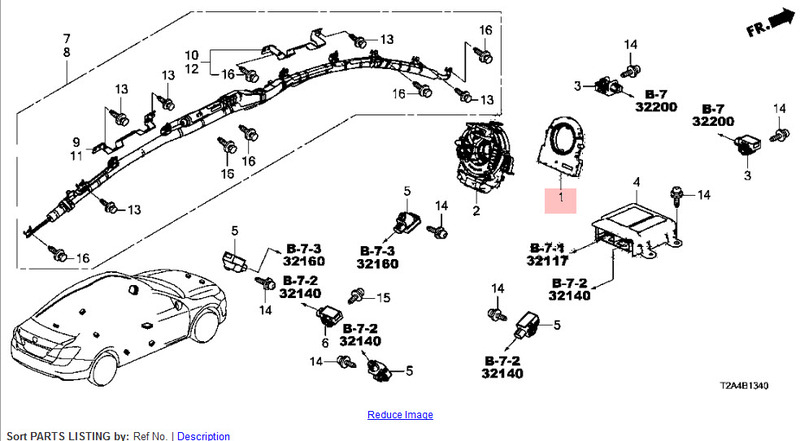 The steering angle sensor for a 2013 Accord is shown in the attached images. *Vehicle Stability Assist (VSA) combines Anti-lock Brake System (ABS) and Traction Control System (TCS) with sideslip control. Last edited by redbull-1; 04-14-2014 at 11:00 PM. I don't know the following linked procedure will work for your year/model, but it works for many late model Honda/Acura products w/ Obd2. It's worth a try.